1912: Coach Ewald O. "Jumbo" Stiehm and his Cornhuskers are said to already be pointing to the season's third game, an Oct. 19 contest at Minnesota. Meanwhile, a varsity-vs.-freshmen scrimmage leaves a Lincoln writer unimpressed. 1917: Former Cornhusker halfback Owen Frank becomes an assistant to coach E.J. Doc Stewart. 1937: Nebraska is favored to repeat as Big Six champion, but a big nonconference game is the first order of business for the underdog Huskers and their new coach, Lawrence "Biff" Jones. 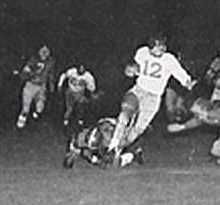 1952: Bill Glassford's team returns from Oregon with a 28-13 win over the Ducks. It was the second night game in Husker history and the first Nebraska victory under the lights. 1962: In Bob Devaneys second game as head coach, the Huskers shock Michigan in Ann Arbor. 1972: Bob Devaney bemoans Big Eight travel-roster limits after the Huskers 77-7 win at Army. 1977: Avoiding a letdown one week after the big win over Alabama, Nebraska beats Baylor by three touchdowns. 1982: Two controversial plays in the final seconds give No. 8 Penn State a win over the No. 2 Huskers. 1987: The Huskers survive a road test against 12th-ranked Arizona State, 35-28. 2002: The Huskers drop out of the AP poll for the first time since 1981 after losing to Iowa State in a game that saw the Cyclones claim their biggest margin of victory over Nebraska since 1899. 2007: Iowa State jumps to a 10-0 lead and manages to run 102 plays to Nebraska's 59, but the Huskers beat the Cyclones 35-17 in Lincoln. 2012: Nebraska rallies from a 17-point third-quarter deficit to beat Wisconsin, 30-27. Also, Tom Osborne announces he will retire Jan. 1 as athletic director, and the search for his successor begins.